Israeli aircraft have bombed a site in Gaza, in the first such action since the declaration of a truce in August. The air strike was carried out on a Hamas facility in response to a rocket fired earlier from Gaza, a statement from the Israeli military said. Residents of the Khan Yunis area in Gaza reported hearing two explosions, the Associated Press news agency said. The August truce ended seven weeks of fighting that killed more than 2,200 people - most of them Palestinians. An IDF spokesman said the aircraft on Saturday targeted "Hamas terror infrastructure". 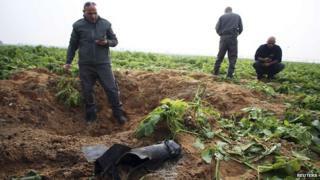 Lt Col Peter Lerner said the strike was in response to a rocket that landed in Eshkol, southern Israel, on Friday. The rocket struck an open field and did not cause any casualties or damage. There were no casualties from the air strike in Gaza, according to local officials. Hamas fired thousands of rockets and mortars towards Israel during the 50-day conflict this summer. Israel carried out an aerial bombing campaign and a ground invasion. More than 70 Israelis were killed in the fighting, most of them soldiers.